I have a transparent SF-1 on display at my office. Mine I think has a transparent back door, but it can be exchanged with the door from the regular SF-1 I also have. The camera is in working order. The lens in question has been on eBay for a couple years. The seller, Kevin Cameras, also has a physical store in California and makes a living charging outrageous prices for hard to find and novelty items such as unique serial number lenses (he at one time had FA43 0000777). 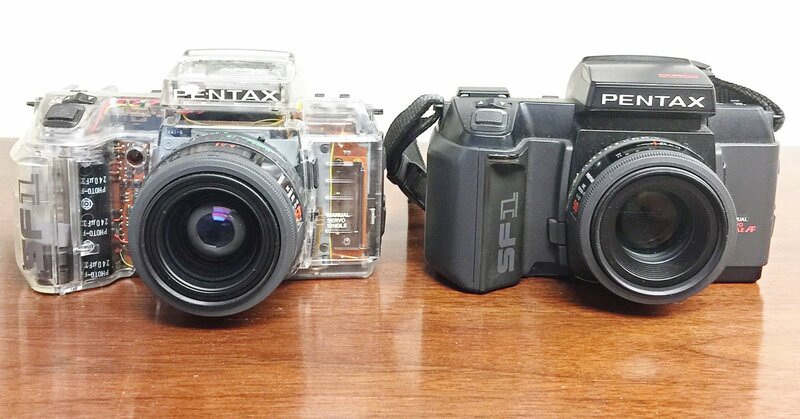 He usually has a substantial Pentax inventory. Collectors are often willing to pay these prices to fill a gap in their collections. Last edited by monochrome; 12-15-2018 at 10:05 AM. I’ve had a F35-70 come apart in my hand when I zoomed it. Further examination showed past abuse, and while I’ll never know what it experienced, having that happen was not confidence-inspiring. I’ve also had the front ring come off my (recently serviced) F50 f1.7. And I can’t think of how many F70-210s I’ve picked up with messed up zoom mechanics. When I compare my old M80-200 to my current F70-210, everything about the ergonomics and build was better on the M.
This is why I wrote "better than most (Pentax) AF objectives"
Mechanical ones are in a different league. I guess the main reason was the weak AF motors of the time. I generally refrain from going too far with lenses that have anything electric. I leave them to the hands of my friend/repairman. Though I know a thing or two about F lenses. The 70-210mm is one of the most problematic. It shows cement problems quite often, and the elements are badly protected from contamination from the outside environment (fungal infections are quite common). IIRC, the 70-210mm has at least one glued "cell" (containing glass elements), which is a solution that became very common with time. This is especially true of late "silver" FA zooms. It's a true pity, because those plasticky lenses - some with plastic bayonet too - perform very well, considering they are consumer zooms tracing back to film time. I believe that most previous zooms of a certain level (read: still worth using) were of the prosumer kind: rather heavy, very good build, and with constant max aperture. Though I found that the last FA version of the 28-105mm (f/3.2 at wide end, made in silver and black versions) performs even better than any previous design. Other contemporary zooms of the same line are not bad either. I'd say that at least they match similar zooms of the past. It is a pity that you never know in advance if the lens would be easily repairable, if you happen to buy one with problems. I don't think we can generalise too much. Each line of Pentax lenses has cheaper, weaker examples, and others with a much better build. You mentioned the 35-70mm. That was a very cheap standard zoom for the SF* line of cameras. It came with my SFXn, when I bought it long ago. I sold it almost immediately in a kind of snobbish repulse for standard zooms, realised after many years that it was not bad at all, and a few years ago decided to buy it again! It is a valuable lens, considering its cost, but even without taking a look at its innards it's absolutely evident that the build quality does not match the F 50mm Macro (which is the F lens I value the most). The construction can vary a lot within the same family of lenses. There are common traits, but the mechanical design varies. High cost lenses are usually better built.